The logo of the Fulbright Awards with the word Fulbright in all caps over a globe. 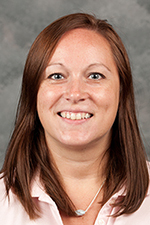 Erin Mikulec, assistant professor in the School of Teaching and Learning, has been awarded a Fulbright Scholar grant to lecture and conduct research at the University of Helsinki, Finland during the 2013-2014 academic year. The announcement was made in March by the United States Department of State and the J. William Fulbright Foreign Scholarship Board. Mikulec joins the ranks of approximately 1,100 Fulbright Scholars from the U.S. who will travel abroad next year. The flagship international educational exchange program is designed to increase mutual understanding between people of the U.S. and other countries. Mikulec says her focus will be to learn from the effective teacher preparation models utilized at the University of Helsinki’s Subject Teacher Education Program in English (STEP). She will guest lecture, conduct research, and work with the University’s training school, where pre-service teachers complete clinical hours through a model similar to Illinois State’s laboratory schools. To further her knowledge of Finnish schooling outside of the University setting, Mikulec has decided to serve as a guest lecturer, and she will teach English in secondary schools throughout the Helsinki area. She purposefully designed the experience to be challenging, even for a veteran teacher and teacher educator. Individuals selected to be Fulbright Scholars have demonstrated tremendous leadership as well as academic and professional achievement in their field. For more information, please visit the Fulbright Program website or contact the Office of Academic Exchange Programs by emailing James A. Lawrence or calling 202-632-3241. Congrats, Erin! That's quite an honor.